Tooth decay happens over time, as the bacteria in your mouth combine with the left over food particles and forms acid. This acid attacks your teeth, dissolves the enamel (upper and shiny layer) of your teeth. Decaying of tooth does not happen in a day. It is a slow process that can later lead to very painful condition, and if not treated early can lead to extraction of the tooth. In this article, we discuss different stages of tooth decay. Before discussing the stages, we need to understand the structure of the tooth. 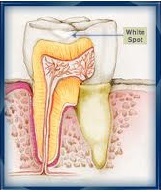 Stage 1: Yellowish or chalky white spots appear on the surface of the tooth indicates signs of tooth decay. In this stage, the process of tooth decay can be reversed with proper treatment, as this can be mainly because of calcium deficiency which is an important mineral for making your teeth strong. Stage 2: During this stage, the decay leads to break the enamel. In this stage, the damage can’t be reversible. Your tooth requires to be cleaned and filled by the dentist at this stage. Stage 3: The decay progress in to dentin. The dentist still can restore the affected tooth area at this stage with the help of filling. The level of pain is different at different stages of tooth decay. Stage 4: During this stage the decay progresses in the dentin and reaches the pulp. 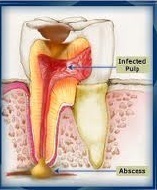 The bacteria in the decay start infecting the pulp-center of the tooth. As a result pus forms in the pulp that causes nerves and blood vessels to die. This can only be treated with the help of Root Canal Treatment. If this is left untreated, the infection will reach the root tip and the bones that surround the tooth, thus causing severe pain. This can further lead to extraction of the decayed tooth. It is, therefore, important to visit dentist regularly, so that any symptoms of tooth decay can be detected in an early state. Damage that is caused in the later stages can’t be reversible making the treatment more complex. This entry was posted on Saturday, November 2nd, 2013 at 6:15 am	and is filed under Dental Health. You can follow any responses to this entry through the RSS 2.0 feed. You can skip to the end and leave a response. Pinging is currently not allowed.